USU Design Tools is an LTI tool for Canvas that provides an easy way to build out the module structure of a course including quizzes, discussions, assignments, syllabus, themes, and template pages. It significantly reduces the time it takes to complete these tasks. KennethWare is most often used as the project name for a product that Utah State University’s Center for Innovative Design & Instruction (CIDI) developed called USU Design Tools. USU Design Tools is a set of tools for Canvas that provides an easy way to build out the module structure of a course including quizzes, discussions, assignments, syllabus, themes, and template pages. It significantly reduces the time it takes instructional designers or instructors to complete these tasks. In addition to this site, CIDI created a Canvas course with some overview information. Many other colleges, universities and school districts have implemented the tools or are in various stages of the installation and evaluation process. Version 2 software is open source and available on the CIDI Github site. CIDI is currently working on a Version 3 of USU Design Tools that will improve the tool’s usability, integration with Canvas, feature packaging, and some additional new features. Utah State plans to roll out Version 3 for it’s own use in the coming months. Some schools have attempted to use the open source code for version 2 on their own. The challenge with this is that there isn’t a support service available to help you get it up and running. CIDI has received inquiries from a number of interested parties, which is great; however, CIDI isn’t a software company or a support organization, so we don’t have a lot of time to support USU Design Tools outside of our own use. Utah State is currently evaluating the potential for creating a commercial company to provide hosting, support, ongoing development and maintenance, and marketing of USU Design Tools. We should know more about our plans for this later this year. If you would like to shape our thinking about this opportunity and keep informed on our progress, please participate in this survey. 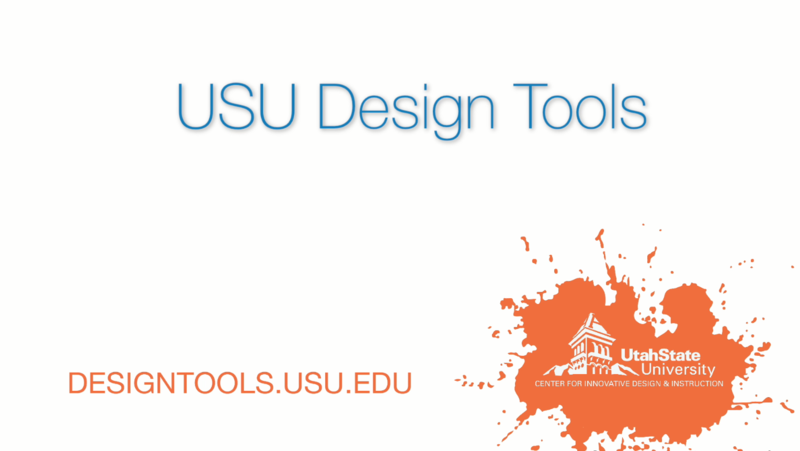 While we can’t speak for the Canvas team, we have collaborated with them on the development of USU Design Tools. Our guess is that these features, being pretty specialized, are lower on their priority list given the roadmap they’re pursuing in support the 1000+ (and growing) organizations using Canvas. USU Design Tools is a great example of a third-party being able to add value to Canvas through Canvas’ open platform / open API’s design, so for the time being it seems the Canvas team is content with letting someone else add these innovations. Or send an email to cidi@usu.edu. Yes, we occasionally help other schools with projects like this. Email kevin.reeve@usu.edu and let’s talk more specifically about your project needs.